Stir fry the onions and dried shrimp in some oil in a pan on medium high heat until fragrant. Next, add the yam and fry until they start to color. Separately, combine the rice flour, wheat starch and water in a mixing bowl and mix until you get a smooth paste with no lumps. Sieve the flour and wheat starch before adding to the water to minimize any lumps. Slowly add the flour paste into the pan while stirring the contents of the pan continuously. Continue stirring until everything is well combined and you have a thick paste. Next add the Chinese five-spice powder, salt and pepper. Mix well and taste to make sure the paste is well seasoned. Pour the mixture into an appropriately sized and greased loaf pan or baking tin and steam for 45 minutes on high heat. 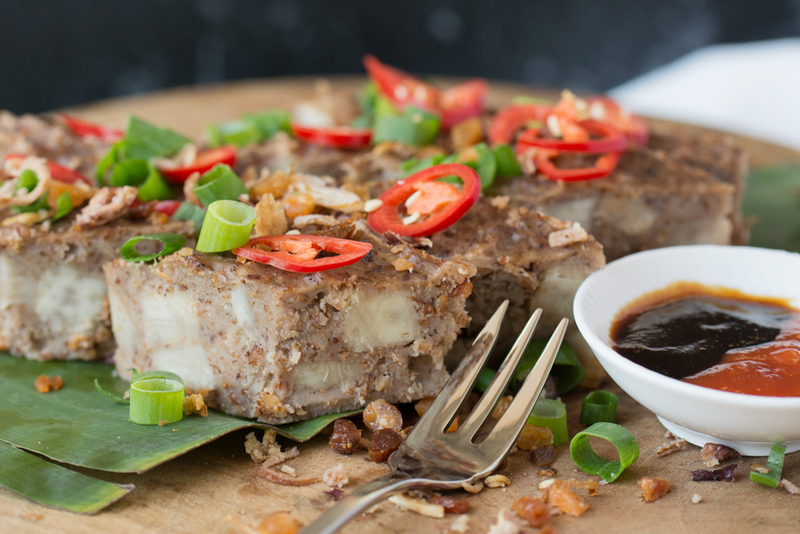 When the yam cake is cooked, sprinkle liberally with the toppings and garnish to your liking and serve with a side of sambal chilli sauce for dipping.